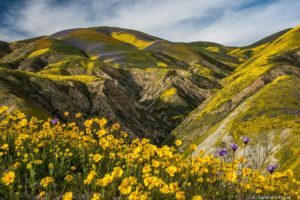 The Carrizo Plain will remain a national monument if President Donald Trump follows the advice of his interior secretary. In April, Trump issued an executive order calling for a review of 27 national monuments, prompting concerns about the potential loosening of protections against mining, logging and oil drilling. Trump’s order instructed Interior Secretary Ryan Zinke to review all national monuments that make up 100,000 acres or more and were created by presidential proclamation since 1996. The Carrizo Plains National Monument spans 204,107 acres and was declared a national monument by President Bill Clinton in 2001. It appeared on Trump’s review list. Under the 1906 Antiquities Act, either Congress or the president can protect federal lands by designating them as a national monument. Trump suggested, though, that past presidents, particularly recent ones, had been abusing the Antiquities Act. “The Antiquities Act does not give the federal government unlimited power to lock up millions of acres of land and water, and it’s time that we ended this abusive practice,” Trump stated. Following his review of the national monuments, Zinke announced that he was recommending to Trump that none of the monuments lose their designations. Zinke also vowed that no federal land would be sold or transferred. However, the interior secretary stated that some national monument designations remain controversial, and some of the monuments contain private property within their boundaries. It is unclear whether Zinke is recommending altering the boundaries of some monuments and/or opening them up to industrial uses. Zinke conducted a 120-day review of national monuments, which included more than 60 meetings with hundreds of advocates and opponents of monument designations. Zinke also took tours of monuments by foot, car, air and horseback, and his agency reviewed more than 2.4 million public comments that were submitted. My personal preference is to protect this habitat from development. To the West within the same valley are ranchers / farmers that sustain their livelihood on FARM SUBSIDIES (Welfare) to not grow what they likely can’t profitably grow anyway. The Carrizo National Monument not only protects a special habitat and us from stupidity, it also saves the tax payers from having to fund the highest paid WELFARE class. That said, if people are to have road access (YES), some form of range management (grazing) should be allowed for public safety.